That's a screenshot of what I found in my in-box this morning when I checked the latest batch of Google News alerts for anything Gannett-related. 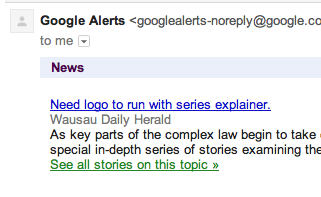 But I don't find this editor's note in place of a hed when I went to the Wausau Daily Herald's website. I think it originally went with this story. Maybe it got caught after Google scraped the story from the Wisconsin paper's site? If I have time later, I'll try to see since it is a js (browser) activated feature that I can probably fiddle with without credentials to the site.